Aram’s Saturday Morning QB: Saturday Morning Quarterback will appear weekly and offer a look back on the Friday night that was while trying to make sense of the madness that is high school football. 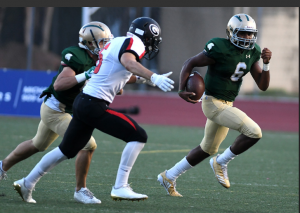 Damien squeezes out win over Glendora: Those expecting a shootout between Damien quarterback Warren Bryan and Glendora’s Bryce Wooldridge never got it. Both defenses were that good, but in crunch time, Bryan got the job done. After failing multiple times to finish drives, Bryan tucked the ball and scored on a magnificent 11-yard run and then ran in the conversion with 2:42 left in what turned out to be the game-winning score to give Damien a 14-7 high school football victory over Glendora on Friday. Maranatha rolls past Pasadena: Maranatha’s Kwon Peterson continued his hot start to the season as the Minutemen routed Pasadena High 36-21 in Maranatha’s home opener Friday night. Peterson went 9 for 10 for 104 yards and three touchdowns en route to Maranatha’s second straight win.Receiver Jacob Moreno linked with Peterson for four receptions for two touchdowns and 123 yards. Peterson and Moreno linked up early, connecting on the first pass for 47 yards. The first drive ended in a Pasadena interception, but the Bulldogs couldn’t capitalize. La Salle freshman CJ Montes delivers: La Salle quarterback C.J. Montes may only be a freshman but his composure and performance in the second half sparked a 42-40 comeback win over Monrovia in nonleague action on Friday night. Montes tossed four touchdown passes, including three in the second half, to lead La Salle (1-1) to its first win of the season. Covina cruises past Pioneer: The Covina High School football team scored early and often and cruised to a 56-21 nonleague victory over visiting Pioneer Friday night at Covina District StadiumLeading the charge for the Colts (1-1) was quarterback Nin Burns II who passed for 207 yards and three touchdowns. The sophomore was almost perfect, going 9 of 10, including two TD passes of more than 66 yards. Burns, who sat out the first two series, came out throwing once he entered the game midway through the second quarter. Bonita holds off Santa Fe: Bonita overcame a mistake-laden first half filled with penalties and turnovers by both teams to defeat Santa Fe 22-16 on Friday night at Pioneer High School. Quarterback J.P. Andrade’s 8-yard run with 7:45 remaining appeared to give Bonita the breathing room it needed, extending its lead to 22-8. The touchdown run was set-up a play earlier when Brandon Stone recovered a fumble at the Chiefs 14-yard line. Northview rebounds: Northview high school’s football team rebounded from its season-opening loss to Charter Oak with an easy 54-12 victory over Rosemead on Friday.Vikings quarterback Steven Comstock, who has verbally committed to Fresno State, threw for 230 yards and three touchdowns. Bishop Amat Fall Sports Hype video is worth all eight minutes. Well Done. Miguel Quicho created this, a Bishop Amat fall hype video that is one of the best I’ve seen. 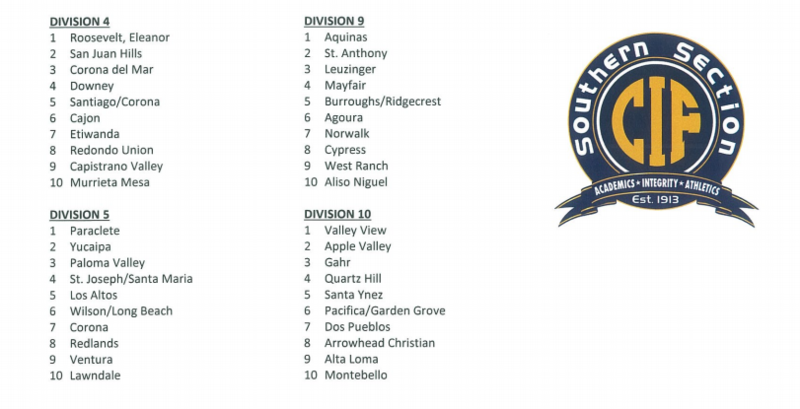 We need a SoCal Prep Legends best school video produced category, my money’s on Quicho. 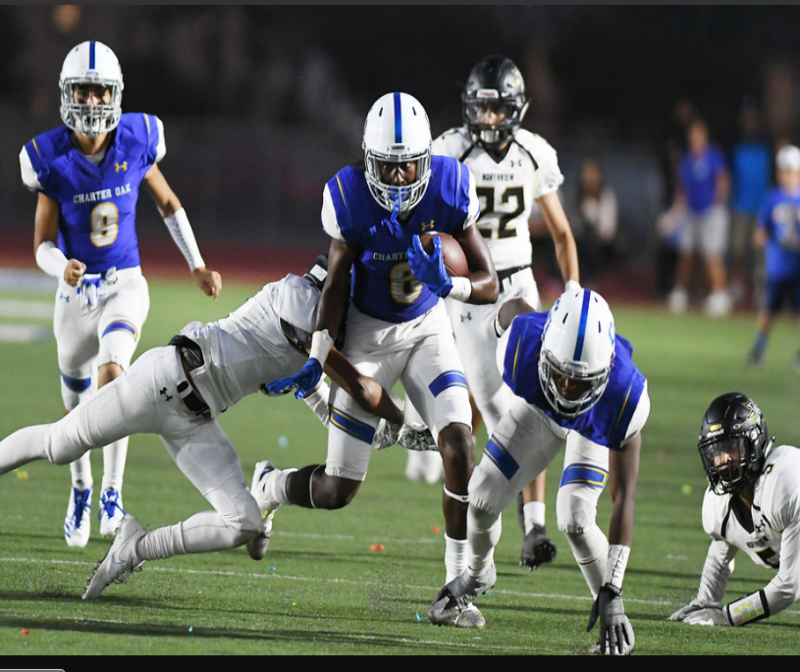 Bishop Amat vs. Loyola Academy at Chicago, IL., 4:30 p.m.
British Columbia Mission at Pasadena Poly, 1 p.m.
Saturday Morning Quarterback will appear weekly and offer a look back at Friday’s games and try to make sense of the madness that is high school football. 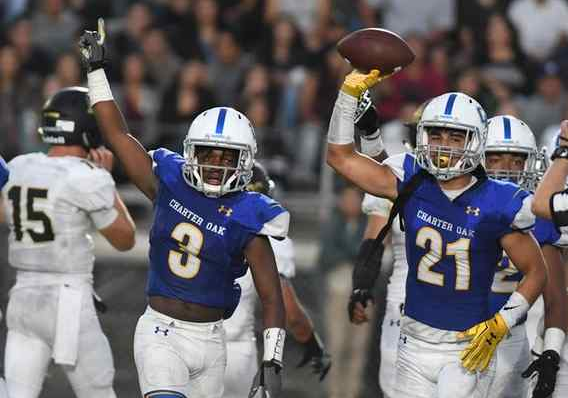 Charter Oak routs Northview: This wasn’t a rematch; it was a repeat.If Charter Oak High School’s thumping of Northview in last year’s season opener was painful, the Vikings better think long and hard before scheduling their crosstown friends again because the sequel was worse. Much worse. Northview quarterback Steven Comstock may go on to have a terrific season, but the Fresno State commit had a miserable start to his senior year, throwing five interceptions, four in the first quarter. That led to a Chargers blowout in the first 12 minutes. 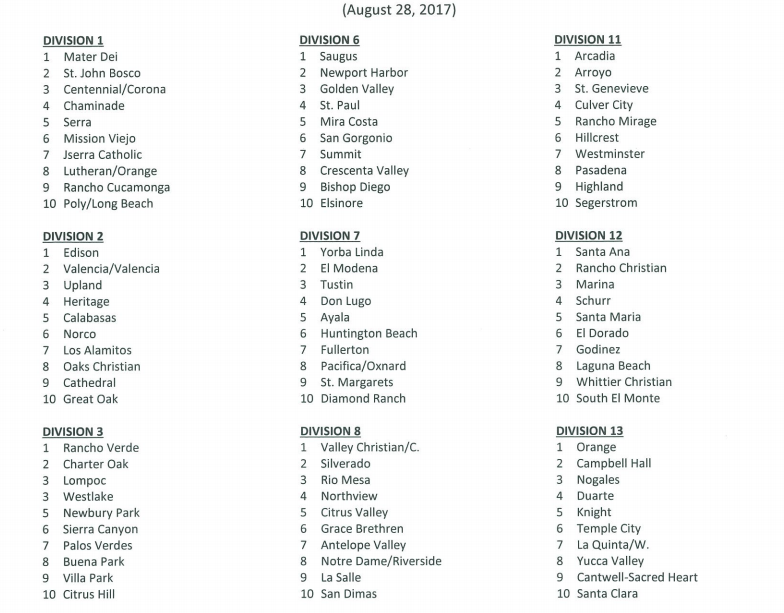 Charter Oak, ranked sixth in CIF Southern Section Division 3, went on to rout visiting Northview 49-14 on Friday. Mater Dei dominates Bishop Amat in season opener: Earlier in the week, Mater Dei head coach Bruce Rollinson warned boosters asking about tickets to next week’s highly anticipated showdown with national power Bishop Gorman about the dangers of overlooking a program like Bishop Amat that wouldn’t be intimidated. The Monarchs responded to that message, with a dominant defensive performance, en route to a 31-7 win on Friday night. With Amon-Ra St. Brown and CJ Parks, two of the best receivers in Southern California unavailable, the high flying Mater Dei offense chose to chew up time of possession and yards on the ground. Arcadia beats La Salle: The Arcadia High defense ruined the debut of La Salle’s two young and rising quarterbacks, sacking them eight times and returning an interception for a touchdown in a season-opening 20-10 win in nonleague play on Friday night. The Apaches held La Salle to 99 yards of total offense while constantly pressuring sophomore quarterback Chris Wilson and freshman quarterback CJ Montes. Orange Lutheran blows out Matthew Takata-less La Mirada: Orange Lutheran High School quarterback Ryan Hilinski did not want football history to repeat itself at La Mirada on Friday night. Hilinski and the Lancers fell to the Matadores in last year’s season opener in the junior gunslinger’s first year. La Habra struggles in loss to La Habra: What better way to start the high school football season with two top programs from CIF Southern Section Division 2 — Upland and La Habra — facing each other Friday night. However, an all-out, first-half blitz of four unanswered touchdowns by No. 5 Upland put a damper on the early season battle as the Scots rolled to a 35-7 victory. “We had a lot of guys back from last year and give them (La Habra) a lot of credit, they had a lot of guys playing their first varsity game,” Upland coach Tim Salter said. South Pasadena takes advantage of Rosemead fumbles: But while Rosemead tried to figure itself out, Jackson Totleben and South Pasadena took advantage of the Panthers’ jitters and won, 20-7.There were nerves all around South Pasadena High School’s Solari Stadium with the Tigers opening the football season hosting Rosemead in a nonleague game Friday night. Both teams combined for six fumbles. Covina rally falls short: Fresh after winning a CIF-Southern Section Division 12 title, Arroyo High School’s football team held off a fourth-quarter charge from Covina to open the 2017 season with a 35-28 victory Thursday. Junior quarterback Ernesto Camacho picked up where he left off last year, throwing for 312 yards and two touchdowns. He scored midway through the fourth on a 1-yard run that gave the Knights what looked like a safe 21-point lead with less than six minutes left. But Covina sophomore quarterback Nin Burns, who struggled with a fumble and interception that led to Knights’ touchdowns, got the Colts back in it, throwing two touchdowns to Tristan Sprague, a 38-yard strike, and nine-yard TD with 2:30 left, but it wasn’t enough. South Hills shocks Crenshaw: For the first time in the 51-year history of South Hills High School, the football team ventured out of the CIF-Southern Section and faced Crenshaw of the City Section in a season-opening nonleague game. 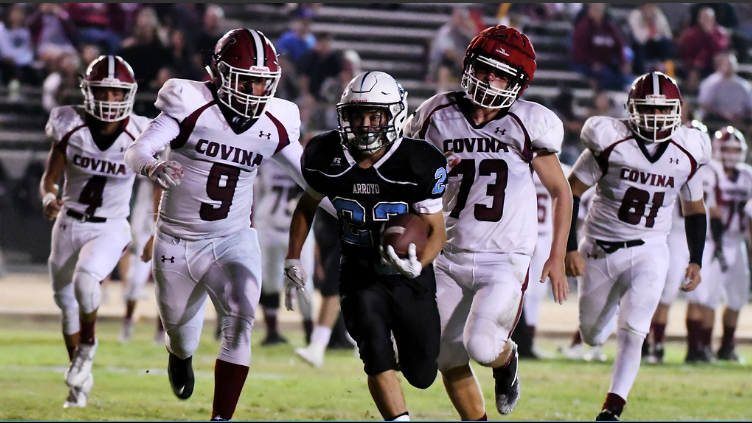 The Huskies, under second-year coach Matt Bechtel, came away with a 24-8 victory Thursday night at Covina District Field. Glendora rolls past Kaiser: A shaky start on defense by the Glendora High football team was quickly fixed as the Tartans stiffened in the second half to cruise past Kaiser 42-20 in season-opening nonleague action on Thursday night. Glendora gave up 20 points and 252 total yards to Kaiser in the first two quarters. But the second half was a different story as the Tartans shut out the Cats while holding them to 59 yards of total offense. Glendora’s offense had little problems scoring after going three-and-out on its first possession of the season. The Tartans scored six touchdowns on their next eight possessions. Pasadena comeback falls short: Despite 18 unanswered second-half points, the Pasadena High School team fell 31-25 to host Buena Park in a nonleague game on Thursday evening. The Bulldogs (0-1) fought back from a 24-point, third-quarter deficit. After Buena Park went up 31-7 with 4:50 remaining in the third, Pasadena scored three times thanks to wide receiver Jaloni West.